Home › Learn › Articles › Is the Amount of Snow and Ice on the Earth Decreasing? for the period 1993 to 2003. FAQ 4.1, Figure 1. 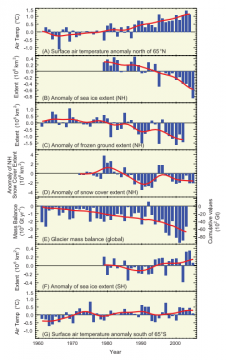 Anomaly time series (departure from the long-term mean) of polar surface air temperature (A, G), arctic and antarctic sea ice extent (B, F), Northern Hemisphere (NH) frozen ground extent (C), NH snow cover extent (D) and global glacier mass balance (E). 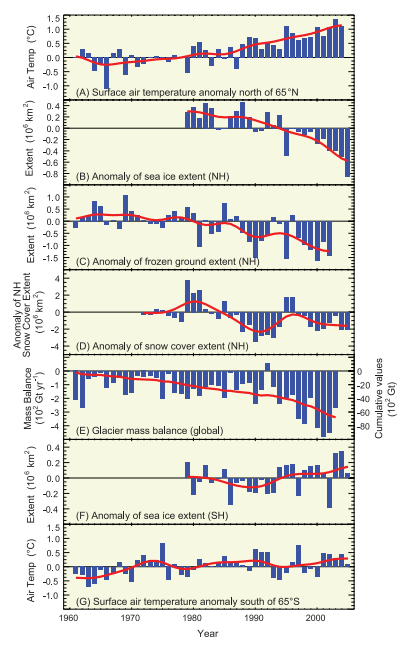 The solid red line in E denotes the cumulative global glacier mass balance; in the other panels it shows decadal variations.